He advertises himself as "the foremost manufacturer of suppressed firearms today . . . the standard of quality and performance the others try to match." He could be telling the truth. Whether Jonathan Arthur Ciener really is number one isn't the point. The only people who count in judging that are the military and intelligence technocrats who evaluate his designs with standard issue adoption in mind, and they're not talking. So, only history will really determine if Jonathan Arthur Ciener was the number one silencer-maker of the 1980s. According to him, though, he is always concerned with his reputation and the quality of his product. "All my designs are built around two major points performance and long life. I strive to moderate the sound as much as possible without damaging the accuracy of the firearm. 1 am devoted to ensuring that a unit fires as well after suppression as it did before," Ciener notes. "For as long as I can remember I've had an intense interest in firearms. I bought my first gun, a Browning .25 auto pistol, at age twelve. That's when I began my collection. This collection branched into military weapons, and then, where else, but into full auto weapons. 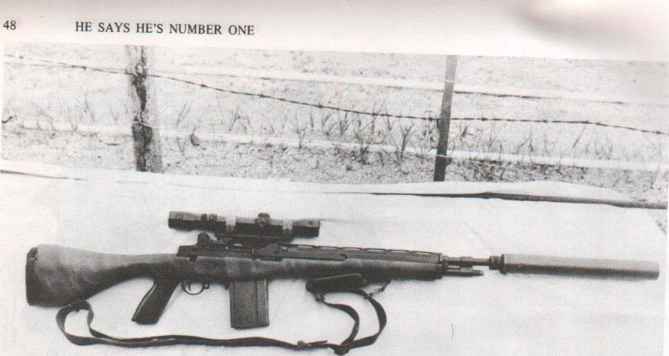 I already had an Ml carbine, so I bought an M2 conversion kit, which I registered during the 1968 amnesty program. That's how I started." Ciener credits his engineering and design abilities to working with his father and brothers as they repaired, rebuilt, and remachined automobiles and motorcycles. "I learned how to design, fabricate, improvise, improve, and machine all sorts of mechanical parts," he adds. American 180 suppressor is only .22 cal. unit Ciener presently builds that can be disassembled for cleaning. He felt this was necessary due to high volume of fire put through this weapon. Precise machining necessary to insure that barrel drill holes line up with chambers of baffles. English Sten Mark II. 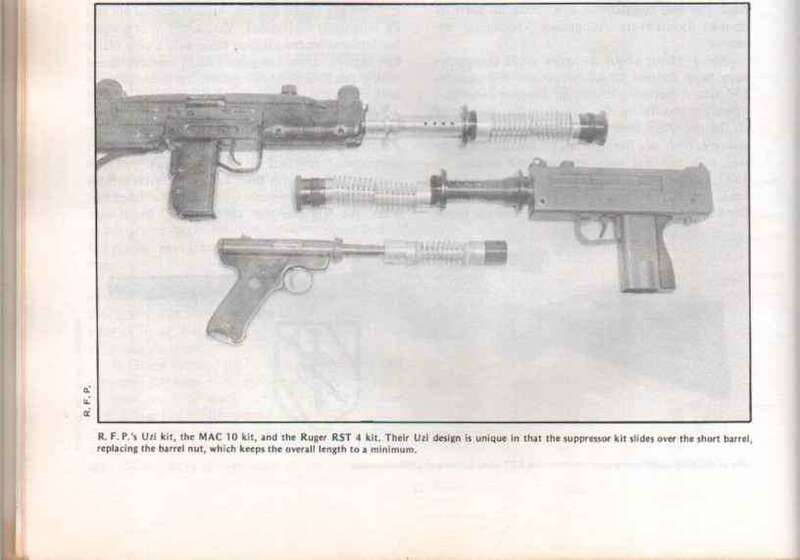 Same features as Uzi, S & W 76, MAC 10 and M3/M3A1 units. H. F. Maxim to Ciener and his peers, know that the only long-term customer relationship worth going after is the various military, police, and other governmental agencies with special needs. Ciener says that despite official denials, suppressed weapons have been used in American covert actions since the Vietnam war. This revelation disputes official comments that "no special mission weapons or tactics have been employed, including suppressed weapons, since test limited field testing and evaluation and use in Southeast Asia," as James W. Dunne, a Defense Department employee, told me. In May of 1981 Ciener said in a press interview that the Delta Team commandoes America sent in to rescue the hostages from their Iranian captors were armed with suppressor-equipped M3A1 submachine guns. Ciener said he could plainly see the weapons in the various news pictures showing our wrecked helicopters in the Iranian desert. Like his competition, Ciener is aiming solidly for this type of market. For example, according to Ciener, his units are ideally suited to SWAT team marksmen. "Concealment is a necessary part of his mission, as he must often maneuver into a position to fire from. After the sound of his first shot with an unsuppressed weapon, his position must be changed to avoid return fire. With our suppressed rifle, he is not put in danger, as the sound is non-directional, giving the adversary no idea as to his location to return fire," Ciener says. According to Ciener, the rest of the SWAT team finds that, the use of suppressors on their weapons allows for superior command and control. "Many a hostage situation rapidly deteriorates to an open gun battle with casualties because the noise of the first fired weapon provokes all those involved to fire unnecessarily," he adds. "With a plan of extraction, as in the case of the Iranian embassy operation in England or our ill-fated Iranian mission, success depends on the team being able to move from adversary position to adversary position neutralizing them [the enemy) as they move but not alarming the next position they must assault. Otherwise the hostages may be harmed before the team can extract them. Suppressed weapons are a must." Since most of these special mission teams use both semi- and fully automatic weapons, they are the prime area for Ciener's developments. "Automatic weapons benefit from suppressors because they allow greater accuracy of fire by reducing the recoil. We have designed light-weight, efficient units for virtually all submachine guns as well as light belt-feed weapons," Ciener says. Ml4 with a Ciener suppressor. With bipod, scope and the outstanding Ciener unit, this is an excellent weapon. H & K unit is adaptation of Ml A/Ml 4 or AR15/M16 unit. Ciener can adapt this basic design to FNFAL, Remington 700 or almost any bottle neck cartridge gun. Uzi suppressor/barrel assembly has features of S & W 76, Sten, M3A1, etc. T/C Contender .22 caliber. An example of specialized units by Ciener. Ciener can and does supply all Contender barrel designs and calibers upon request. Most arc readily disassembled for cleaning. Others don't need it. Superior firearms for suppression since they are single shot, with no noise lost through action upon functioning. Walther PPKS .380/.22 with screw off suppressor. Interchangeable barrel that is three inches longer than standard allows Ciener to use bleed off holes and holding chamber as in H & K's very successful MPS/SD. This weapon has the additional feature of easy disassembly of suppressor for cleaning. No wipes to wear out or affect accuracy. Virtually all noise escaping from unit is from ejection port upon functioning. Optional slide lock improves performance as in all auto pistol designs. As his governmental business solidifies. Ciener is standardizing his stock line of weapons to include the M16A1, Ruger Mkl. Ml A/Ml 4, Remington 700, Ruger 10/22, Browning .22 autorifle, and the Marlin 780. which Ciener describes as "virtually silent." 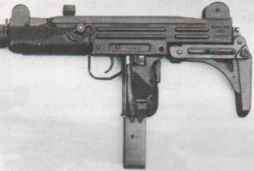 He also markets barrel/suppressor assemblies for the S & W 76, Uzi. 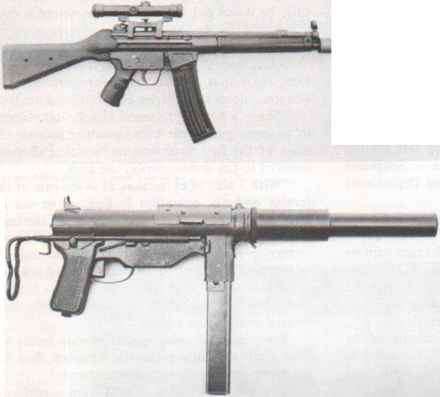 Sten Mkll, M3A1, and Thompson Contender. There are certain weapons which either lend themselves well to suppressors or are popular with the special mission people who use them. For this reason, standardization is relatively easy. However, Ciener will also do any custom work necessary for any legitimate customer. "We do custom designing and fitting of our suppressors on just about any other weapon the customer has in mind. Be assured that we have or can procure almost any weapon you may wish to own," he adds. One of his more ambitious designs was a unique suppressor for the American 180. He recalls. "That 170 round magazine and the 1200 rmp cyclic rate requires a very special suppressor design. Most existing units would be worthless and would need rebuilding after only two magazines of operation. "But, not mine," he adds with pride. "Our easily disassembled unit was designed with this specific weapon and its user in mind. It's rugged, long-lasting, and it will do the job. Our barrel/ suppressor assembly can easily be disassembled, cleaned, and assembled in minutes." Like others, Ciener also sees a great deal of value in the military using suppressed weapons to introduce reticent trainees to the firing range. He notes, "Suppressors make people who are fearful of firearms more at ease when they're around them. I have personal experiences in which I have gotten nonshooters to fire weapons and become avid fans when we used a suppressed weapon. There is a very real difference between firing weapons with ear covers and firing the same weapon with a suppressor. No worry about flash, blast pressure or comfort while shooting are some of the advantages to suppressed weapons." Ciener is also very familiar with the technology of firearms suppressors. Noting the difference in caliber pressures, for example, he blends his design techniques and the materials used to match the needs of the smaller calibers as well as the larger weapons, all while keeping the physical configuration of the units practical for field use.